Designed for standard duty use in your cafe or restaurant kitchen, the reliable Avantco MX10 gear driven 10 qt. 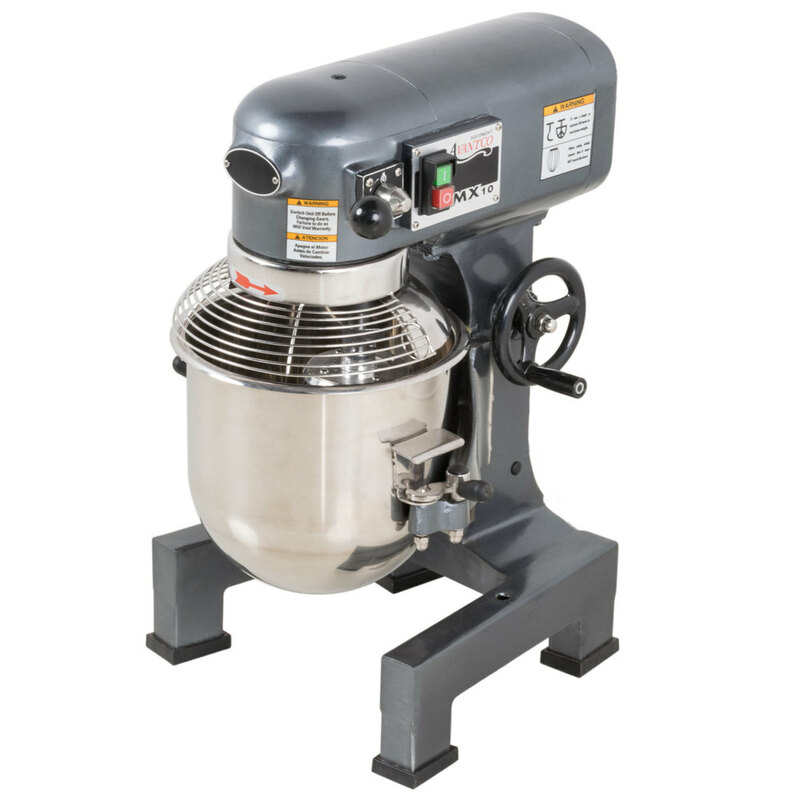 commercial planetary mixer makes it easy to mix ingredients for your specialized baked goods and desserts! 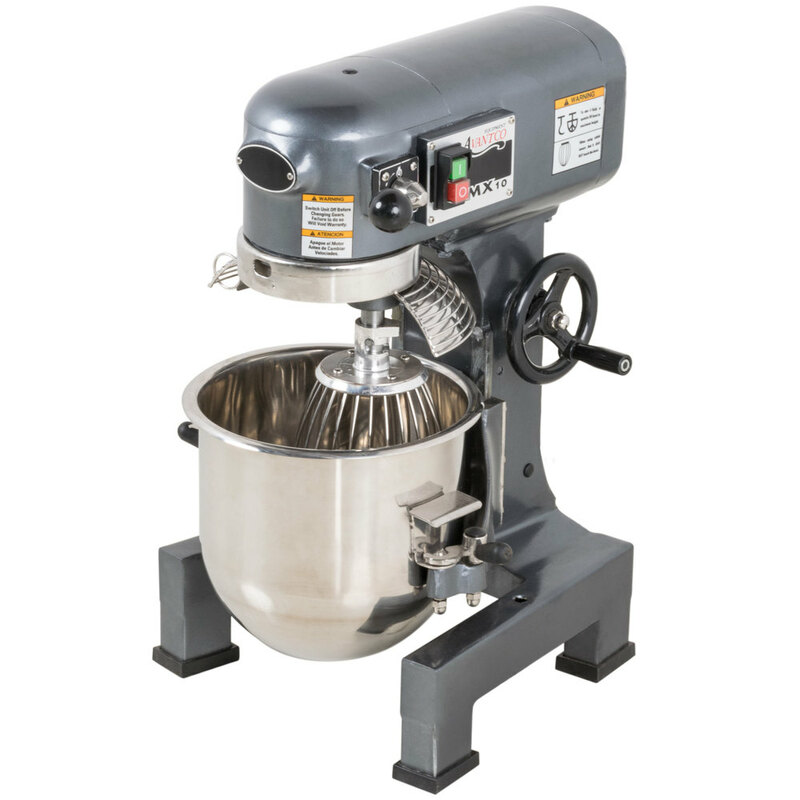 Featuring a 100% gear driven transmission, this mixer boasts a powerful 3/4 hp motor to make quick work of your kitchen tasks. This mixer features easy-to-use push-button controls, and you can change the mixing speeds to low, medium, or high for maximum convenience and control. A black reset button is located on the left side of the mixer, just above the base. Unlike many other mixers, the included 10 qt. bowl and wire whip are made of 304 grade stainless to resist rust. 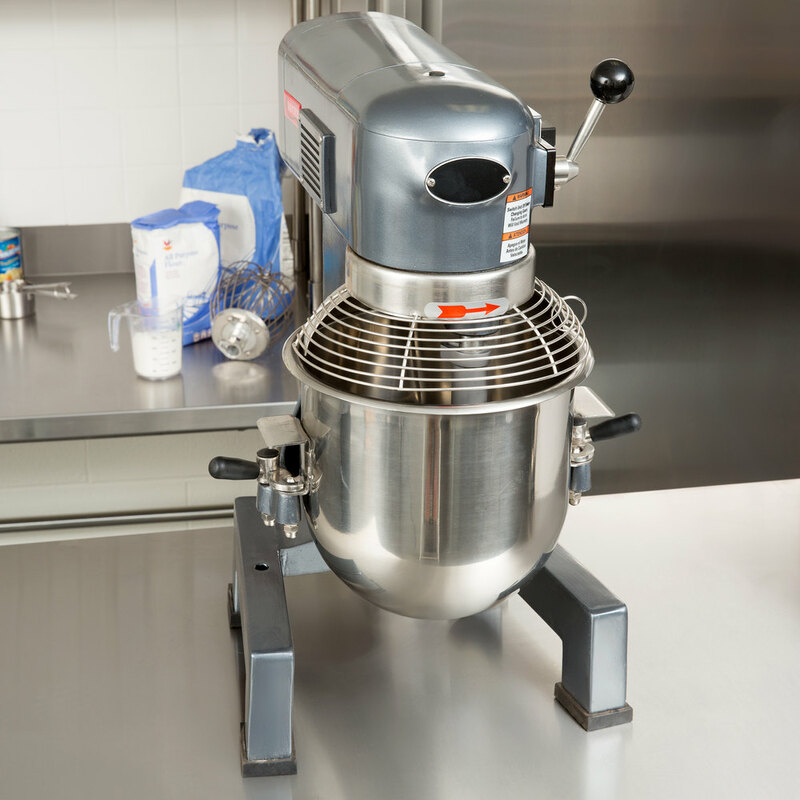 Plus, the Avantco unit comes with a stainless steel guard, flat beater, and dough hook so you can start using your mixer the moment it arrives! I had seen problems with the smaller version where the mixing bowl gets stuck to the base of the machine but since this one don't actually leave the bowl on the base while mixing it isn't a problem. You just add what you are mixing, turn the handle to raise the bowl up to the correct position, drop it down after you are done, and put pressure on the front to release the clip in the back. Couldn't be easier. Been using this for almost a month now. I was debating between this an a Kitchenaid Professional 8QT. I went with this because of two reasons, larger capacity and a more serious motor. In retrospect it was a bit overkill for my use but at least I don't have to worry about stripped the gears (but do read the instructions if you plan to use it for lots of dough kneading). It comes with a dough hook, whisk attachment, and a paddle attachment. All work pretty well but my only major complaint is that if you are working with small amounts it has a hard time picking up the materials. For example when I am whipping 6 egg whites it won't reach and I have to whisk it by hand first to increase the volume enough. When I double the recipe and do 12 egg white it has no problems at all. So when you have enough ingredient in the work bowl this thing works flawlessly. The only other complaint I have is the mechanism to raise and lower the work bowl is a bit annoying if you are trying to work fast as it is a rotational wheel type, whereas I prefer the simple lever type. Yes the wheel enables you to adjust the height of the workbowl but honestly how often do you not need it to be at highest and lowest positions? I've never had that need so that's my only daily annoyance. Overall this is a good buy for the price, I just hope I don't have to call tech support anytime soon but in retrospect I think I would have been fine with just the kitchenaid mixer as I mostly just need to whip egg whites and not being able to whip a small amount is a bit of a annoyance as well. The shipping on this product was quick and it arrived in perfect condition. This mixer is a workhorse. We use it daily and have it running at least 2 (non-continuous) a day. It was a perfect upgrade for us. The motor did start to make a noise about three months after we got it it we did not notice a change I power or any difficulty in mixing. This Avantco 10 Qt. mixer is one of my favorite equip. in the rest. I used it every other week to make my jellies out of flour and had no problem until this point. Huy V. from Che Empire, Inc.
so far so good, there is alot of shaking that occurs when we use it, even on a stand mixer table. But I like the size 20 quarts was too big for us so this is the perfect size and at the price we could afford to get an extra bowl which is nice. The mixer worked great and was powerful enough to mix pretzel dough. However, soon one of the bowl holder tabs broke. Webstrauntstore was great about service and recommended an upgrade for more heavy duty service. Thanks guys. Really heavy duty mixer. Lots of safety features on this unit. It is large for smaller quart mixer, so make sure you have enough space on your counter. I ordered this mixer for my cheesecake business and was not disappointed. Well made and easy to operate. It has been working perfectly without any problems and delivers as advertised. I've owned this mixer for about two years now, and overall it does an admirable job. Like many reviewers have noted, it is quite heavy duty, and the gear drive has worked flawlessly. I have used it mainly for cake batters, frosting, bread and pie dough. My only complaint is that, as some have mentioned, the fit between the paddle blade and the sides and bottom of the bowl could stand to be built to a tighter clearance tolerance. It does leave butter in bottom of the bowl. The mixer itself it great and does just what I need it to. The legs are a problem. They aren't level (the back right one is significantly shorter than the other two) and the mixer rocks like crazy. I have it shimmed but sometimes they wiggle free. Not looking forward to drilling holes in my table to hold it down, but that may be my only option. Great mixer for my home bakery! I'm a food blogger and cookbook author that uses a mixer actively on a daily basis. I needed something that would be big enough to make 6-8 dozen cookies at a time. Making homemade bread is no big deal for this well put together mixer. Gear driven is the best option. This mixer is built to last a for a very long time. Extremely easy to clean. Comes with a 10-quart bowl, attachments: dough hook, beater and whisk. Heavy duty mixer is well-built and high quality. I purchased this mixer for use with my large quantity orders...it works perfect and saves a ton of time! Super easy to use too. I love it! I will admit that I was a bit skeptical when purchasing this mixer because of the negative reviews it had. Now after receiving my mixer I am completely happy so far with all the the items I have mixed in it. It is an excellent size for my baking and catering business. LOVE IT! Instead of struggling with my recipes in my small kitchen aide mixer, I'm able to double and in some cases, triple my recipes and get the job done sooner. The only problem I've had with the mixer so far is when I want to change speeds on it, sometimes, after turning it off before moving the lever, it will not go into that speed. It's a little inconvenient. Been looking for a 10 quart mixer for months, and came across this great machine! The price is buy far e best on the market and love the size of the mixer! Great for smaller batches, but when a counter top mixer isn't large enough! This mixer is amazing! It is affordable for it's size. It is powerful and large enough capacity for our commercial retreat center kitchen. We love how the safety guard must be in place before the mixer starts, and how it is easy to lift and click back into place. My only complaint is that it does not come with a plastic splash guard. This is a great little mixer. We mostly use it to mix pasta dough and a few desserts (cakes). It has stood up well so far after a couple months of use, no complaints, it works exactly as advertised. Have probably mixed over 1000 dough batches with this unit and it has worked perfectly. No issues with 8 pounds of dough (5 pounds of flour) at 63% hydration. The avantco MX10 is a decent mixer, especially for the price point. It fits plenty of cake batter and buttercream, and gets the job done a lot quicker than my smaller mixer. 5 Stars for a great little mixer; but an equal number of stars for terrific customer service! Here's the story. I have had this mixer in my bakery to use for small quantity dry ingredient incorporation for about a year. Unfortunately, Tuesday morning it would not start. I called customer service late in the day on Tuesday, and the customer service rep (Rob) was very understanding of my situation and assured me they would do all they could to get this mixer up-and-going again, as quickly as possible. Given he was on the East coast and me in Arizona, the technical expert was gone for the day; however, he assured me they would handle the issue first thing Wednesday morning. Not only did Rob call me first thing this morning, as promised, but, importantly, he sent me what they thought the issue was via e-mail. Sure enough -- a quick, uncomplicated 10 minute repair/adjustment on my part to the mixer's gear box, and it was performing as normal. Well done, Rob -- Thank-you! I LOVE this mixer!! This is exactly what I was needing to save time, increase the batch amounts of my cake recipes, frosting, cookie dough....and more. I just wish the mixing bowl had handles on it for easier holding when turning cake batter into the pans....it gets tricky, but still doable. I also wish it had a lid to place on the top when full of frosting that I need to store overnight. However, using plastic wrap is working just fine too. Those little quirks aside, I still love the mixer. It does a great job and worth adding to your bakery equipment. 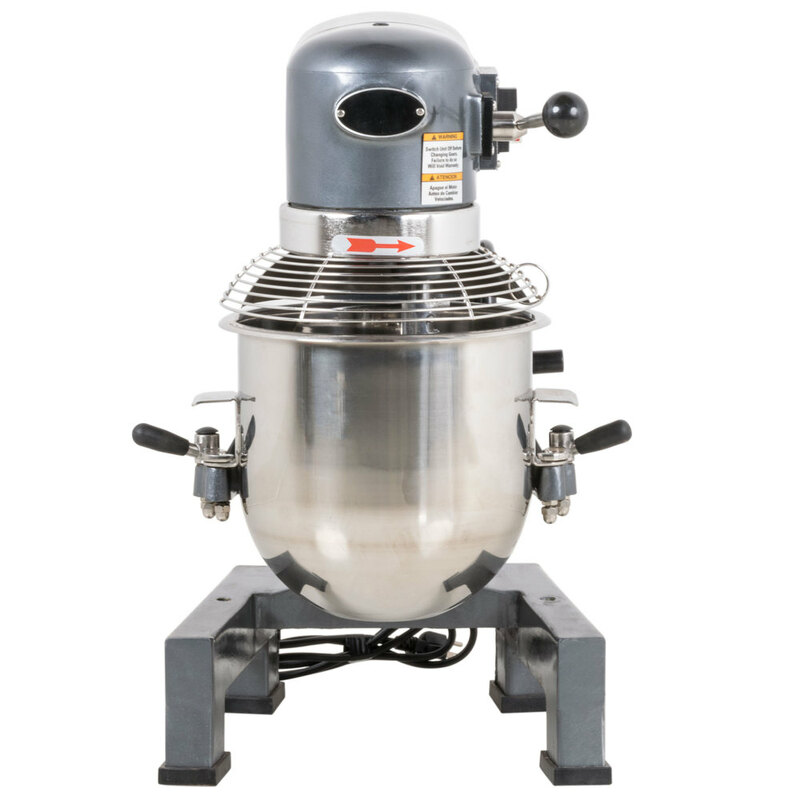 This avantco gear driven stand mixer is great for huge batches of cake batters, frostings, bread doughs., etc. I love it because it holds a lot of product in the bowl. The Avantco MX10 Gear Driven 10 Qt. 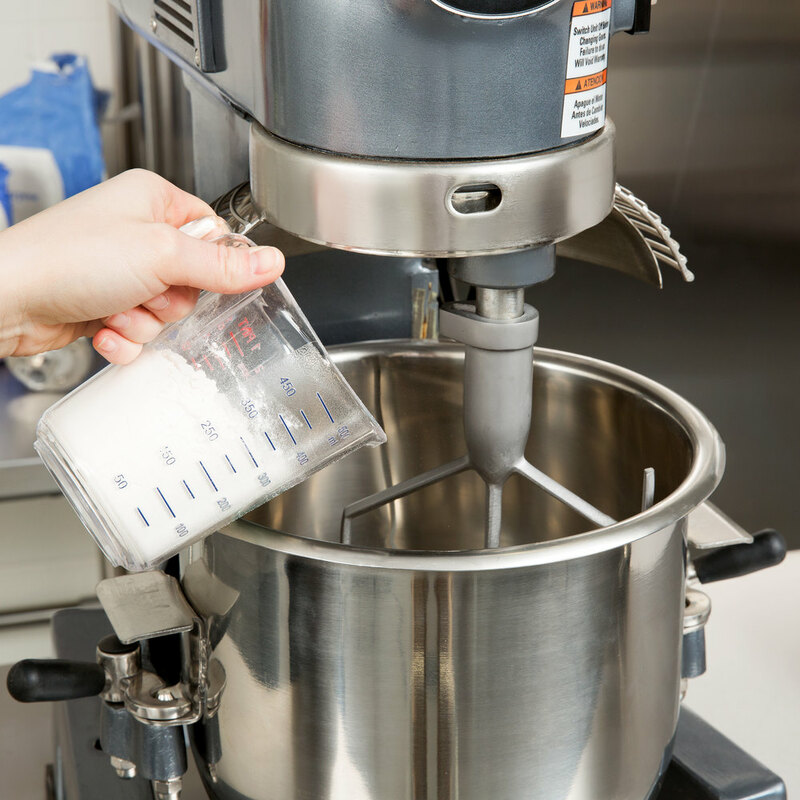 Standmixer is the only mixer you will ever need for your kitchen and/or bakery! Extremely powerful which equates to large batches and efficiency! We used one of these at the restaurant for YEARS, mostly for mashing potatoes (about 1200 pounds a week! ), but it picked up other duties when some of our other mixers failed. I've been known to sling batters, eggs, and cold salads through one of these (the dough hook works great for those). This machine is a beast for plowing through work. Only problem we ever had was after one of the guys dropped it off a table (while cleaning) and bent the safety cage. There was a magnet in the back that closed the safety switch, so it would stop if the cage shifted. A new cage fixed the problem, and no more problems.